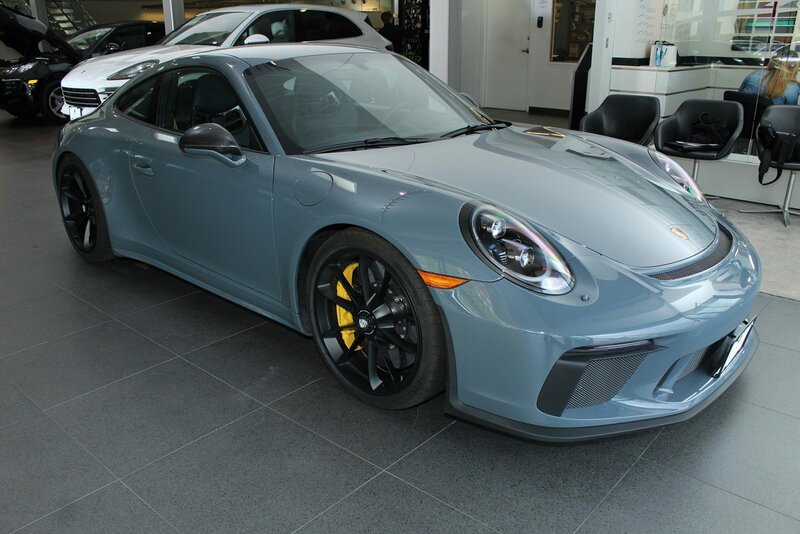 ***PORSCHE APPROVED CERTIFIED***6 YEARS/UNLMTD WARRANTY***2018 PORSCHE 911 GT3***GUARDS RED WITH BLACK/RED INTERIOR***WELL EQUIPPED WITH: BASE 911 GT3 082 Extended Range Fuel Tank, 23.7 gal 250 7-speed Porsche Doppelkupplung (PDK) 431 20 911 GT3 Wheels 474 Front axle lift system 497 Preparation for Rear Logos Painted 581 Luggage net in passenger footwell 583 Smoking package 68 Leather/AlcantaraÂ® Interior in Black i.c.w. Red Stitching 749 Leather Interior Stitching in Red 810 Floor Mats 878 Steering Wheel and Gear Lever/Selector in Black Leather 9VL BoseÂ® Surround Sound System CGU Headlight Cleaning System Covers in Deviated Exterior Color CWJ PORSCHE Logo and Model Designation Painted EKG Interior Trim in Carbon Fiber i.c.w. Leather Interior G1 Guards Red P11 Full bucket seats P13 Automatically dimming mirrors with integrated rain sensor QR5 Chrono Package with Preparation for Lap Trigger XAJ Side Skirts Painted in Exterior Color XCS Lower Trim of SportDesign Exterior Mirrors in High Gloss Black XDK Wheels Painted in Satin Black XEY LED Headlights in Black with Porsche Dynamic Light System XNS Steering column casing in leather XSX Seat belts in Guards Red. ***CONTACT OUR KNOWLEDGEABLE SALES STAFF TO SET UP YOUR TEST DRIVE TODAY! 888-600-3538. All conditions subject to credit approval. Dealer installed options additional. All offers plus tax, tags, and a processing fee of $699. Stock photo colors, options, and trim levels may vary. Vehicles subject to prior sale. PLS.NOTE: THE PRICES LISTED ON OUR WEB SITE REFLECT THE SPECIAL SALE PRICES AND IS CONSIDERABLY LESS THAN OUR REGULAR ASKING PRICES. Specifications, Features, Safety, and Warranty data are based on what is available as standard specs/features per trim level, for the designated Model-Year, and may not apply to vehicles with added packages or options. Not responsible for typographical errors. Final price must be verified by management. Warranty not valid on vehicles over 100k miles. Ask dealer for details.